As fun as this game is to catch a new Pokémon for the first time, the quest to catch them all is not easy. There’s a handful which requires travelling far and wide for, and others where the nests have not been identified yet. The latter requires exploring the entire town or city for. To be dedicated, the player has to start keeping a physical or mental journal, recording times when these pocket monsters have been spotted and hopefully returning to catch them on a regular basis. Over time, these critters can be raised and trained to fight other Pokémon. Each Pokéstop is a landmark to admire. If this game is to evolve, I propose that the company work with museums and national parks to create new gyms and stops truly worth exploring. I do not like the fact it’s tailored for urban centres. The more mobile data being sent is indicative of which Pokémon can appear. I ask what happened to the thrill of the hunt at out-of-the-way places? The promo trailer made going out of urban centres and to large parks exciting! The official announcement trailer made this game look spectacular. There’s a scene showing players out in huge parklands. I knew that none of it would appear in the actual game, but if augmented reality can mean holoprojection from cell phones to show players holding a Pokéball and seeing them for real in the environment, I would be all for it! Current technology can not do that yet, and unless we are living in the Matrix, none of that is going to materialize. With my idea, the stops can include something about the land, art piece or area to be studied. I know how hypermedia works, and this game has nothing to do with it. Now if the Pokéstops included a hyperlink to a web page about the item in question, it can be used as an educational tool while players are hunting. They can learn about an individual from a headstone should a stop be in a graveyard. The last time I was out with a buddy playing this game, we were taking the time to talk about who some of the individuals buried here are and how they helped build this city while refuelling (gathering Pokéballs, potions and revives). Instead of rolling out this game to new countries, Niantic Labs should be thinking about how the game can be used in education. Eventually, the desire to catch them all will fade unless something new is included. In the anime, Ash has to look at his Pokédex to learn something about the Pokémon he spotted. Sometimes, he has to consult with his friends to understand the critter and depend on the knowledge they hold as locals to become a Poké Master. In the game, none of that is conveyed. While players can share battle tips and how to raise their pocket monster, there’s an aspect of discovery not being explored. I ventured into a new area to find them not too long ago and had no knowledge of what was around that area known as Selkirk. Upon finding GLO Restaurant, which I knew of but never located, I can go find Dratinis to eat. Well, not really. One way to make the Niantic / McD deal work is to have players work off their meal by walking around to hit the stops, like at this location. While this company is working with others as sponsors / partners, just what playing at McDonald’s entails has not been revealed yet. In an article published on Fortune, Niantic Chief Executive John Hanke revealed his company is talking with several companies interested in partnerships similar to the deal that turned nearly 3,000 McDonald’s restaurants in Japan into stops for collecting virtual supplies or “gyms” for on-screen battles. Playing a video game while feasting on fast food does go hand-in-hand, but I can think of better restaurants to go dining at. McD offers fast food and I crave quality food. 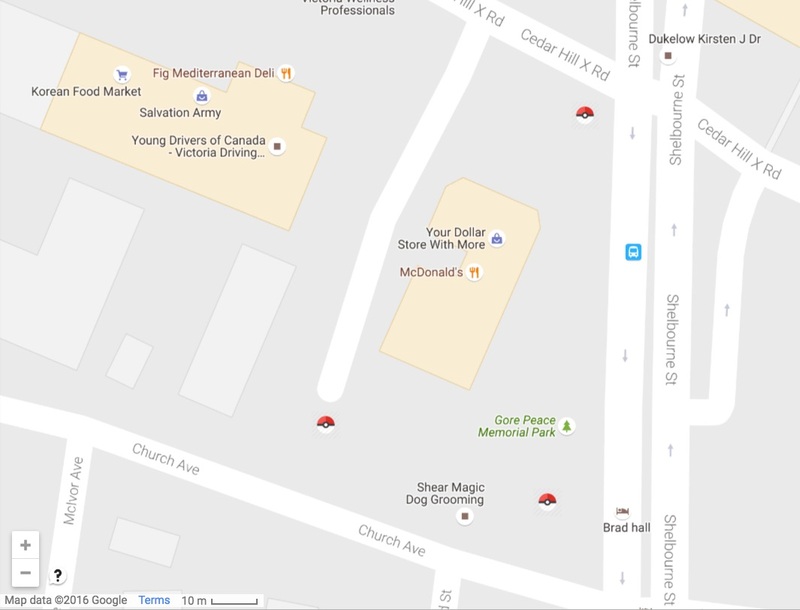 In my exploration of my hometown, I found a Poké Stop and Gym right in front of Romeo’s, a local family owned and operated restaurant at Broadmead Village. Sure, the cost of dining here is twice the price, but at least I know they deliver quality and I want to support local! McD’s tends to quantify their popularity and personally, I do not think that works. For the company behind the mobile game, they have to find creative ways to make this game appealing to other markets.